Carole's Chatter: Train or Plane? Which do you prefer? 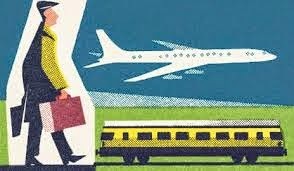 Train or Plane? Which do you prefer? I am a fan of train travel, particularly in Europe (including between London and Paris). Of course, many people prefer to drive themselves rather than do either plane or train. This is not my preference for one simple reason – here in New Zealand we drive on the left – and when I am in Europe I find driving on the right really difficult – not on motorways but at intersections etc. I have never traveled on a train! I checked into it for our most recent trip, but the price was outrageous for our destination. I will check into it again though, I think it sounds like a fun way to travel.